In our military life, those wise words continue to ring true. Just when my spouse and I think we’ve found a great place for our family to settle, we’ll end up with military orders to move elsewhere! With this latest PCS season, we’ve decided keep our home and list it as a rental on MilitaryByOwner. Along with leasing our home, we're aware of the need to stay organized with our records and receipts. If you're also interested in becoming a landlord, I'm sharing three tips we’ve found for setting up a fool-proof system to keep track of rental expenses. It’s a good idea to keep a running record of your rental income and any expenses that come along. Plus, creating a log will make things much less overwhelming when tax time rolls around. As the ebook defines, the varying columns and rows of a spreadsheet will help keep your accounts organized, even if you are miles away from your property. If you have more than one rental property, you may need to branch out from a simple spreadsheet. Consider investing in a personal finance computer program or a small business accounting software package like QuickBooks. Having a more detailed interactive application can give you more options to analyze your rental property data. On the random chance that you’ve lost financial records via a computer glitch, there’s the old standby of a handwritten ledger. Of course, jotting things down on paper may be too old school for your busy lifestyle. However, written notes could complement a spreadsheet or accounting program and serve as another facet of your landlord game plan. A quick tip for tracking important paperwork is to find a secure way to store it. Rather than building a Mount Everest size pile on your desk, find a sturdy accordion file folder in the office supply aisle of the store. Each slot can be labeled to sync up with your expenses, for instance pest control, repairs, and other expenses. Having a central location to store your paperwork will help ease your stress level, especially in the midst of a military move. Most likely, the majority of your billing statements are emailed to you or are searchable online. Yay for saving a tree! With this in mind, when you do receive an important in-person receipt, you’ll probably want to keep it intact. Ink and delicate paper can fade and you’ll need a proper copy on hand for tax purposes. Scanning in each item or taking a photo with a mobile device creates a digital copy of the receipt to store on your computer or in the could. A quick search online will lead to several different programs or applications like CamScanner that allow you to upload images and organize receipts with ease. Let’s say you need to make a few notes on the importance of a particular receipt. Rather than writing on the ticket itself, you could add it to your computer with digital details. A program like Evernote allows you to add remarks to your file, as if writing in a notebook. and store it on their server. As mentioned in the post, Making It Work: Military Landlords and Long Distance Property Managers, it’s important for a landlord to have “a written schedule of a walk-through or casual observance of the property.” Keeping a timeline of when you’ve checked on the house eases the concerns about small issues that could become big problems. Consider using an online agenda, such as Google Calendar. With this daily sense of organization, you can set reminders for seasonal maintenance chores and note items that have been repaired/replaced. Similar to brief journal entries, the inputs on your calendar can help cover your bases when filing your taxes and when communicating with your tenants. 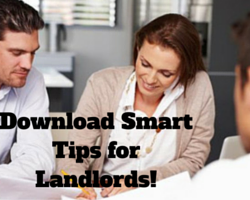 If you’ll be taking on the role of being a landlord, consider the points discussed here. By keeping an orderly system for your expenses, receipts, and schedule, the more positive you’ll feel about venturing into property management.